Last night, when I noticed just how many unswatched teal polishes I had recently purchased, I figured I should probably get on that. Soooooooo, today's nails are skittles in teal, brought to you by my iPhone. The photos I took with my Cybershot were just nawt color accurate. It zapped out a lot of the yellow, so my nails looked more turquoise, and... no. Just.................. no. Bonita Fall and Catch is a teal creme polish with a really faint shimmer. It reminds me a lot of SinfulColors Rise and Shine, but without seeing the 2 side by side, I can't say for certain that they're dupes. Application was great... 3 easy coats. My only complaint, I wish I would've added another coat of clear for a little more shine. SinfulColors Peppered Amazon is also a teal creme with a more pronounced shimmer than Fall and Catch. In the bottle, it looks like it would be a silvery/white shimmer, but it's more of a golden champagne color on my nails. This one was practically opaque in 1 coat, which rarely happens for me. Definitely a must-have for any stash! Sally Hansen Seasational is a more blue-leaning teal. Honestly, I like the color in the bottle and would probably love it on its own, but I'm just not loving it in comparison to these other teal shades. That being said, application was still great. 3 coats, but I probably could've gotten away with 2. 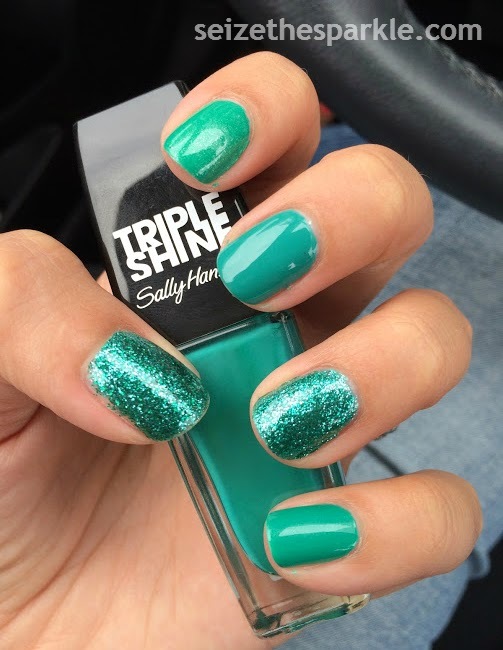 Sally Hansen Seanic houses extra-small teal glitter in a teal jelly base. Looking at the bottle, the base seems like it would be clear. Seanic is so densely packed with glitter, I only noticed the teal base when I applied the first coat. I probably could have used 3 coats, but I added the 4th because I was trying to remedy the problems I was having with Archipela-Glow, and I needed other nails to work on while I waited. Sally Hansen Archipela-Glow contains small teal, blue, and silver glitter in a clear base. The majority of the glitter is teal, but you can see the blue and silver if you inspect it closely. I thought the glitter payoff would be the same as Seanic, but I was wrong. Coverage was still pretty sparse at 2 coats, and I knew I had to get something on my nails that would cover them a little better. So, I added 2 coats of Seanic, which for the most part, is pretty similar color-wise... just a slight difference in color, but a biiiiiiig difference in formula! In an attempt to add a little bit of differentiation between my glitter nails, I painted on another coat of Archipela-Glow before sealing up my left thumb and right pinky with clear coat and Seche Vite. You can kind of tell when you look at them closely, but for the most part, Seanic outshines Archipela-Glow. What do you think of my teal skittles?